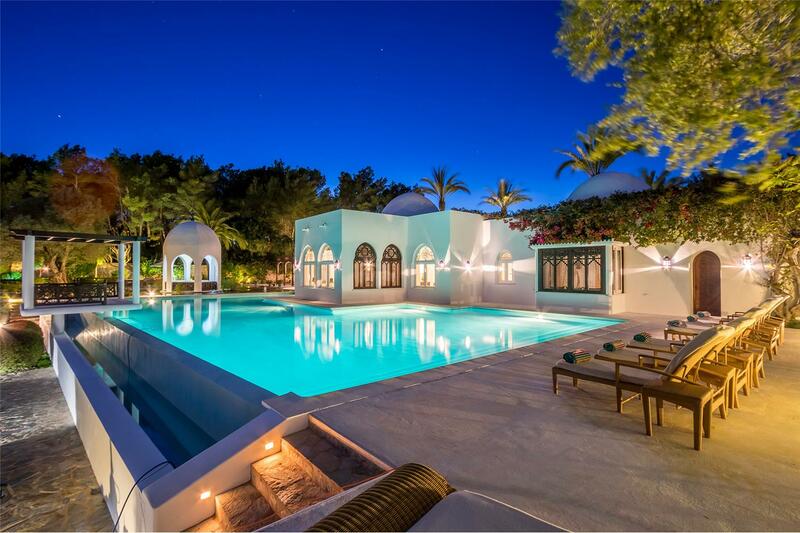 Villa Fatima is a stunning luxury Ibiza rental villa. 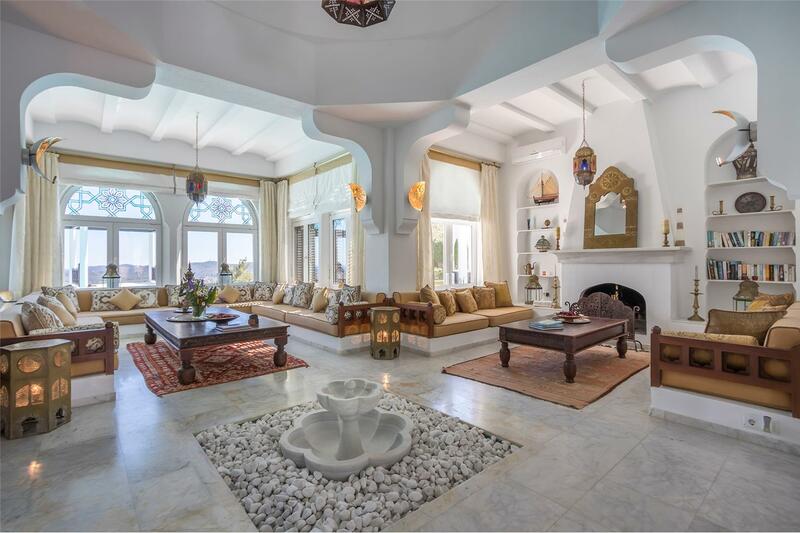 A reproduction of the Mosque of Zebid in Yemen, this is truly a Moroccan palace. 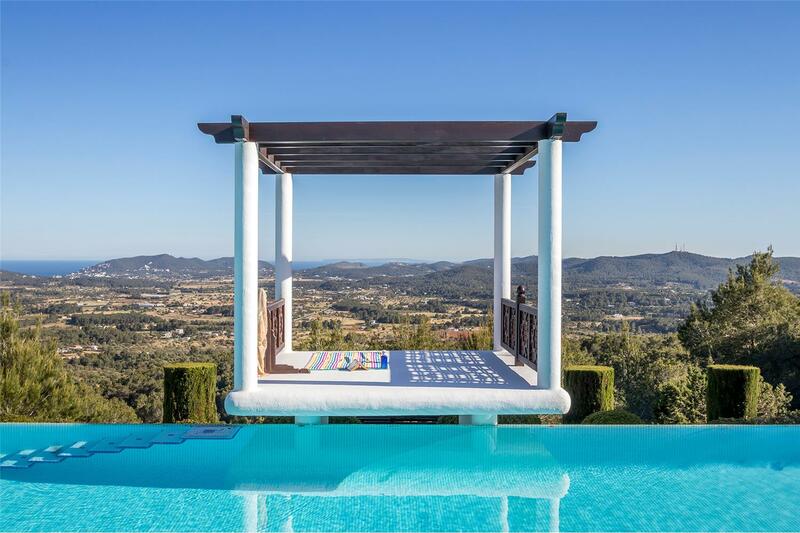 Located on top of the hillside near to San Lorenzo, in the heart of Ibiza, offering outstanding panoramic views across the beautiful Ibiza countryside with also with distance sea views. 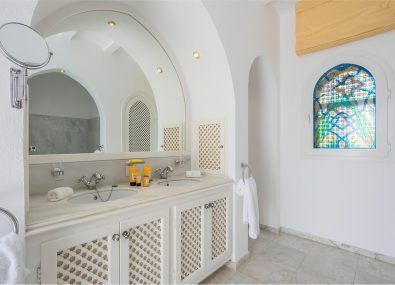 Sleeping 12 people in six bedrooms and five bathrooms. 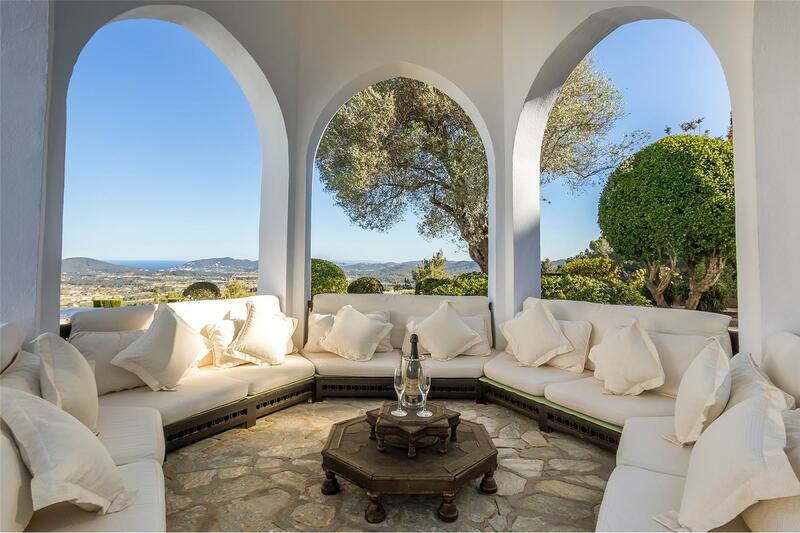 The main part of the villa forms a cross with the focal point being the central courtyard. 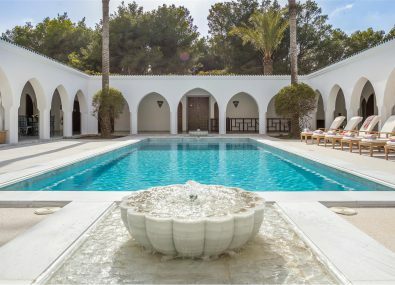 The courtyard, along with the 12m x 5m swimming pool, form the core for the rest of the villa, with all rooms and areas leading from it. 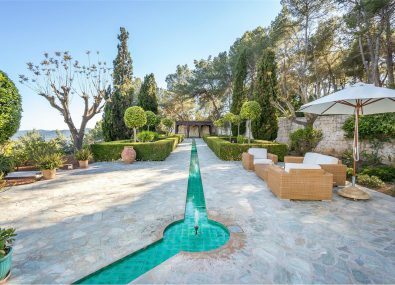 One of the exits from the courtyard leads through to the water gardens, the small lake and Tea House. 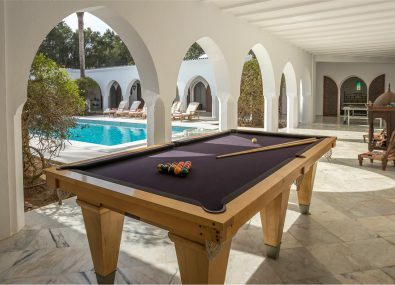 The living area comprises a fully fitted kitchen with all modern appliances, a huge lounge with large screen plasma TV with satellite, DVD and CD. The lounge is very light from large windows and has Moroccan style furnishings. 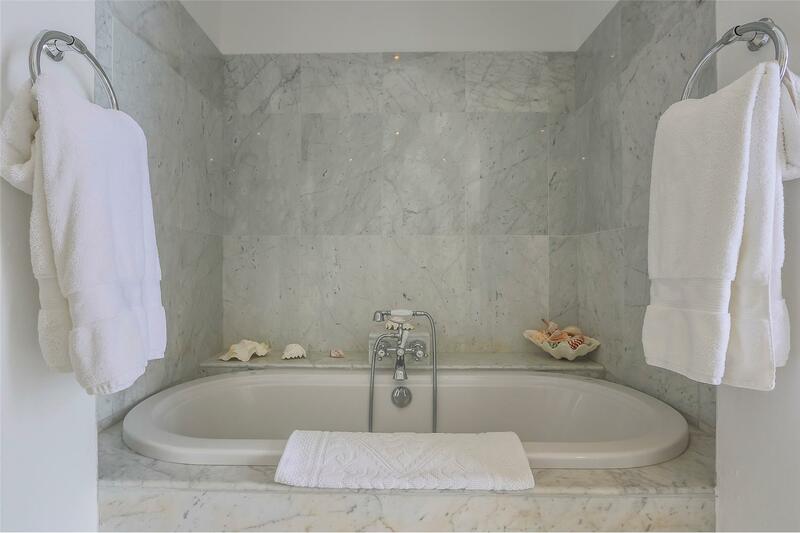 The master bedroom has a king-size bed and an en-suite bathroom with a bath and shower. 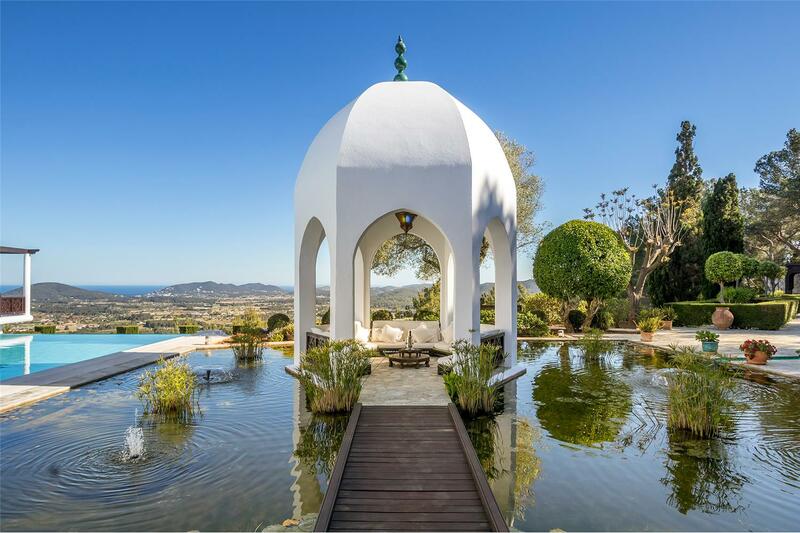 It opens onto the terrace and courtyard and has a fountain. 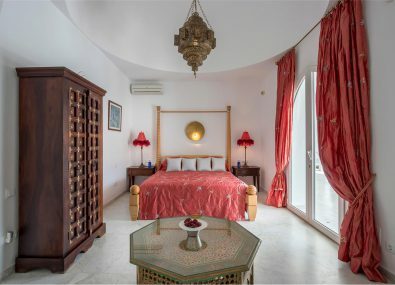 This room also has large plasma screen TV with satellite and DVD. 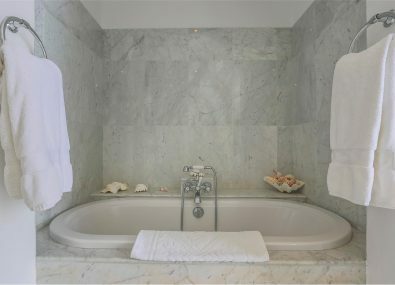 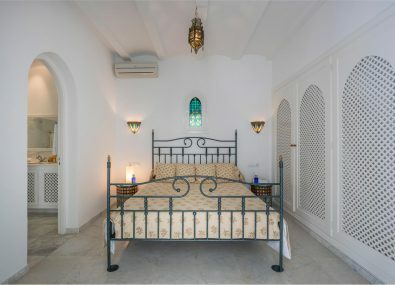 On the other side of the central courtyard are two bedrooms – one with a double bed and an en-suite shower room; the other is a large double suite with en-suite shower room and Jacuzzi. 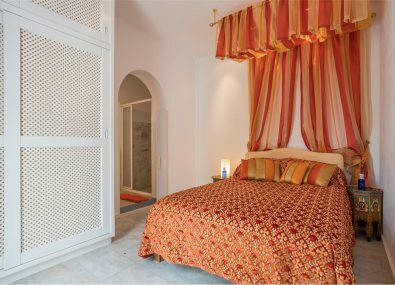 Located in this area are two further double bedrooms with a shared en-suite shower room dividing them. 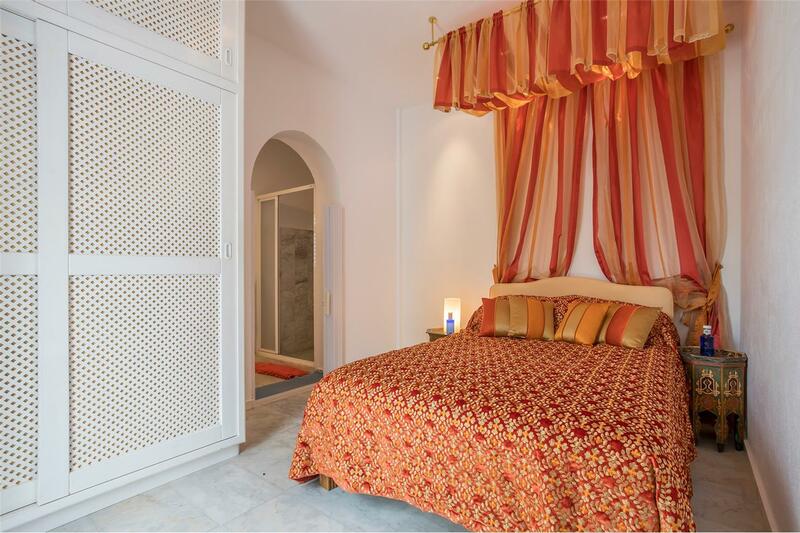 On the outside of the house is a double bedroom with en-suite shower room, together with a private courtyard. 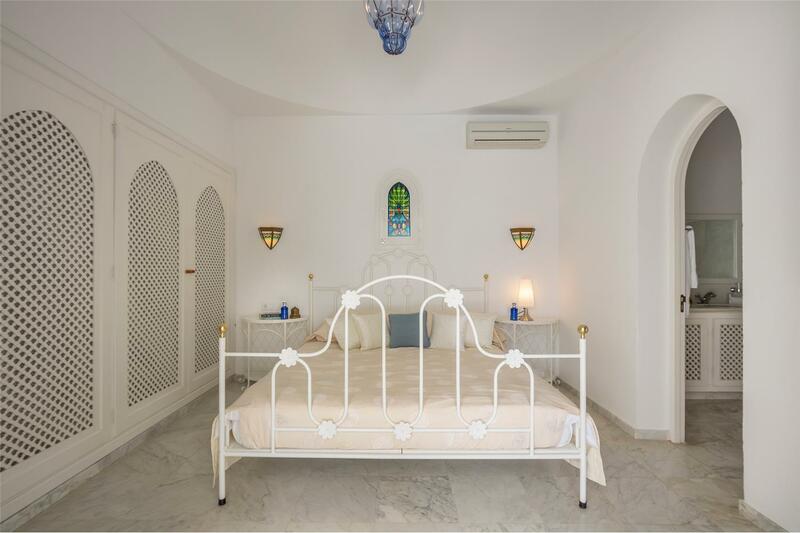 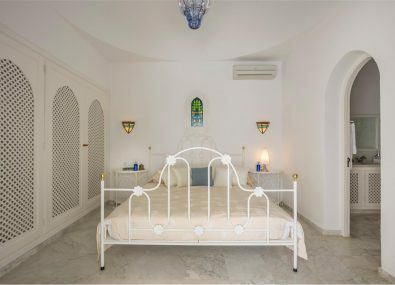 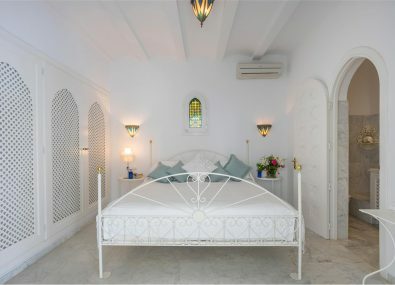 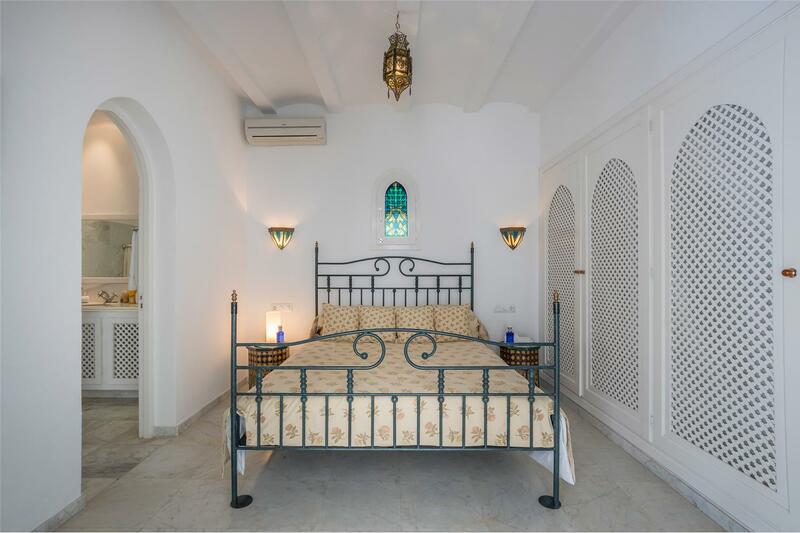 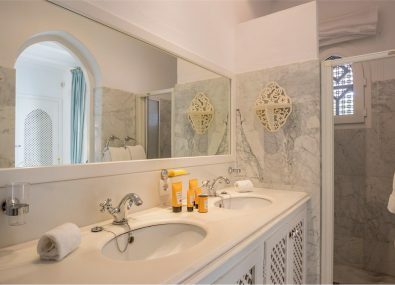 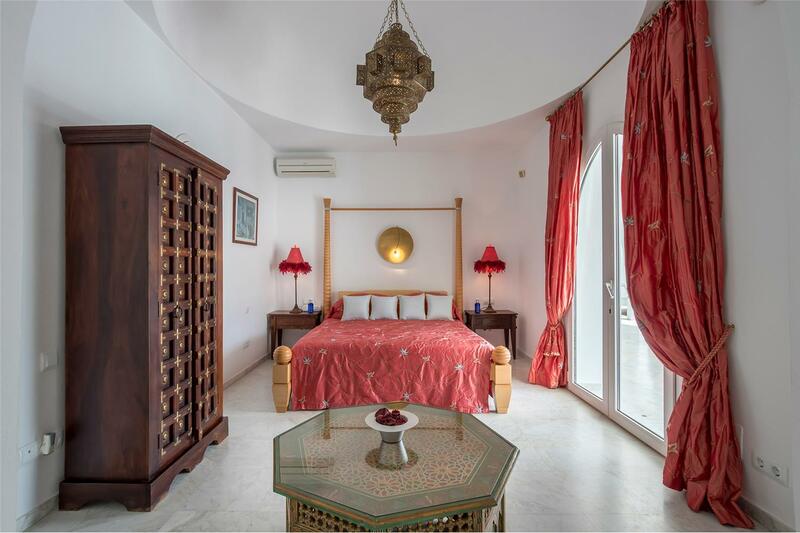 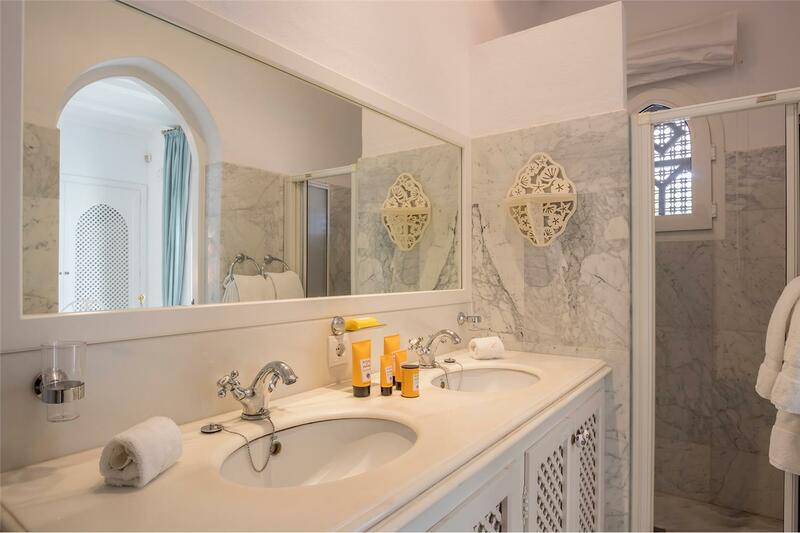 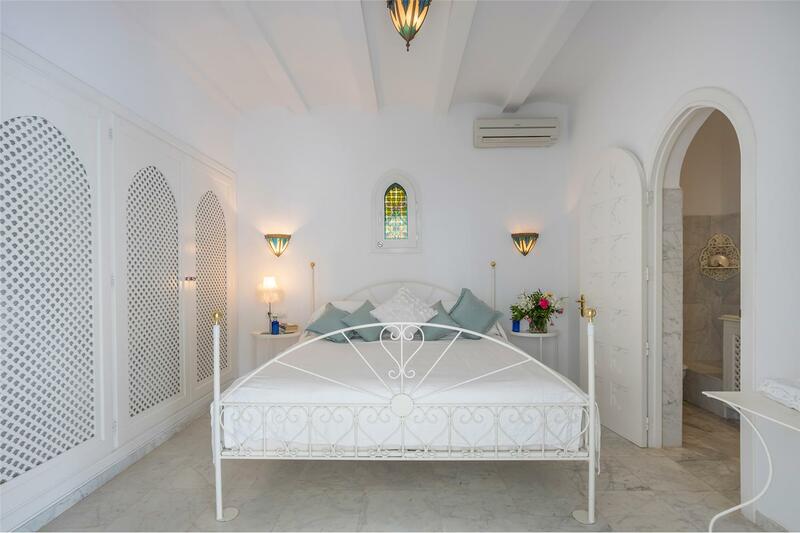 All the rooms throughout this impressive Moorish palace are elegantly furnished. 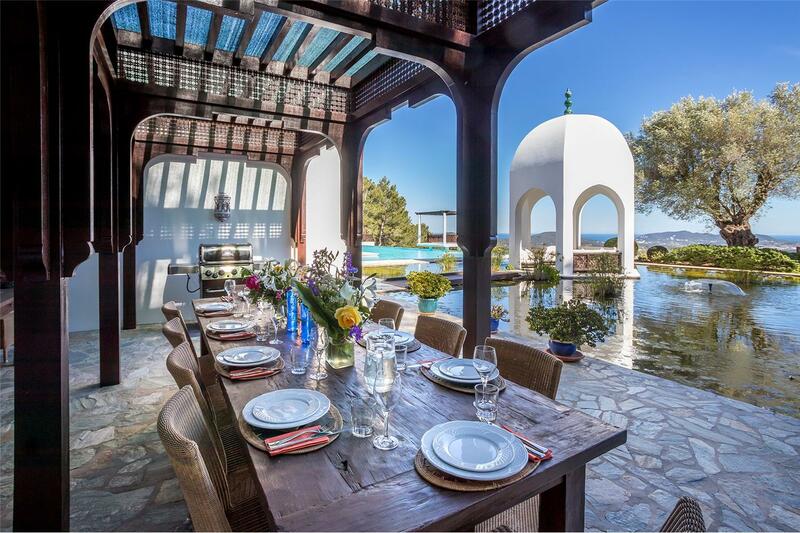 Located in front of the main part of the villa is the impressive 22m x 12m swimming pool. 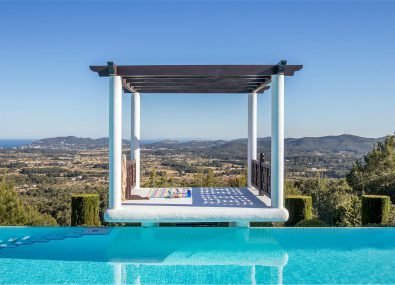 An infinity pool, which creates a wonderful contrast to the spectacular panoramic views of the countryside and across the sea to neighbouring island of Formentera. 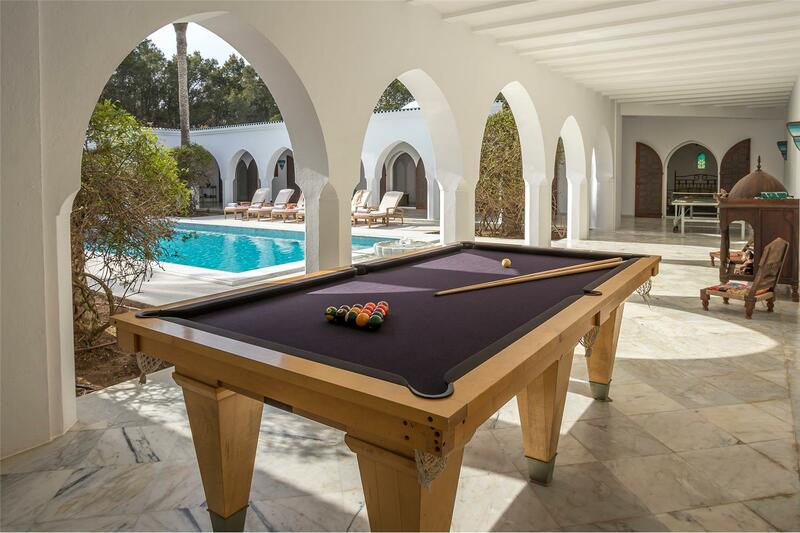 To the left of the pool is a Bedouin style tent with a dining table to seat 16 people. 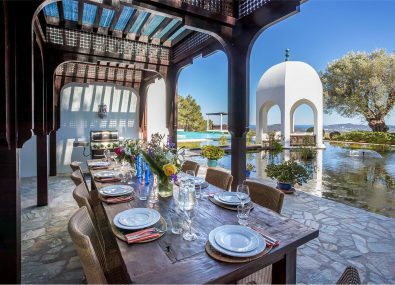 Located outside the kitchen are two further dining tables and a barbecue under a wooden pagoda. 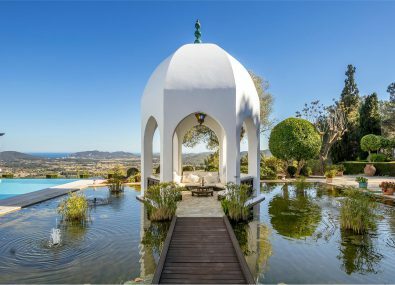 Surrounded by a small lake and accessed by crossing a small footbridge is the Tea House, an impressive domed, octagonal, open-sided structure. 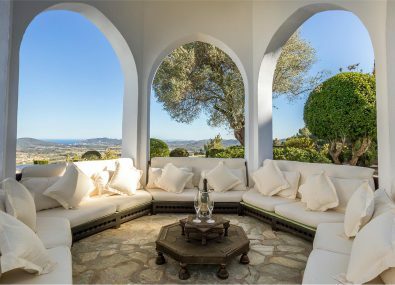 This is a wonderful spot to take tea in the afternoon, enjoying the gentle mountain breeze. 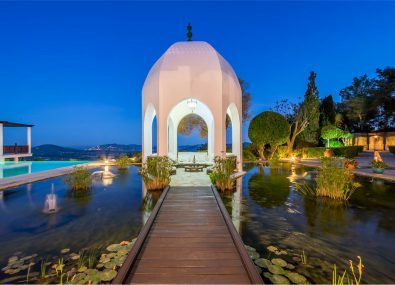 A very romantic spot and perfect for weddings and christenings. 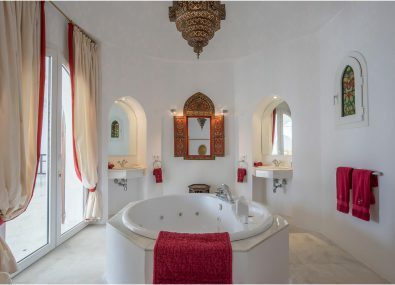 Further on from here you reach the formal Moorish gardens. 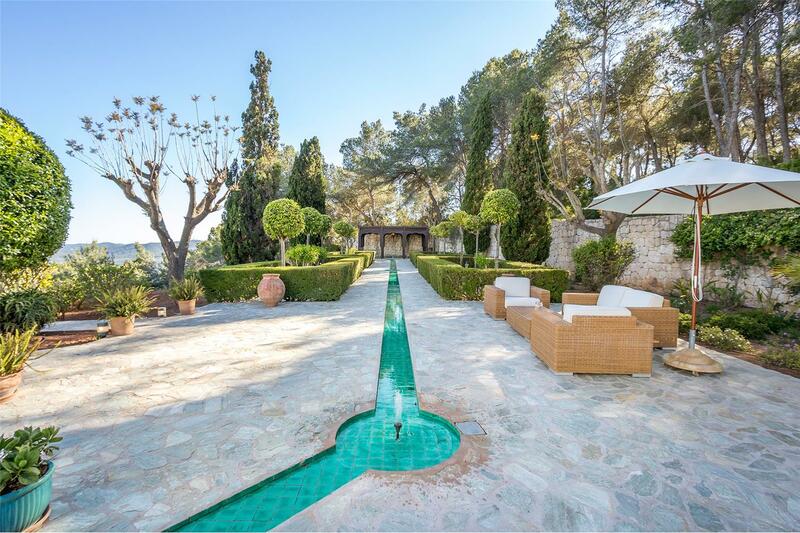 These have typical boxed style hedges and lollipop shaped orange trees. 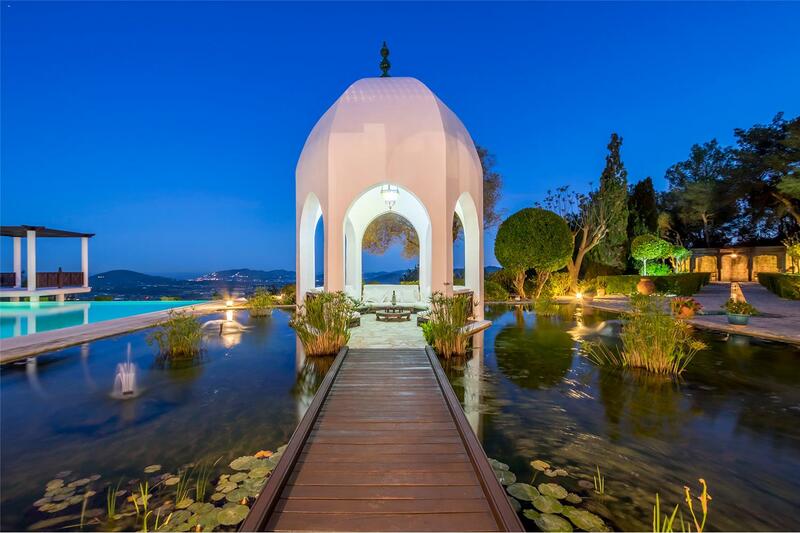 Additionally, three small fountains and aquamarine tiles form a water line which runs back to the lake and Tea House. 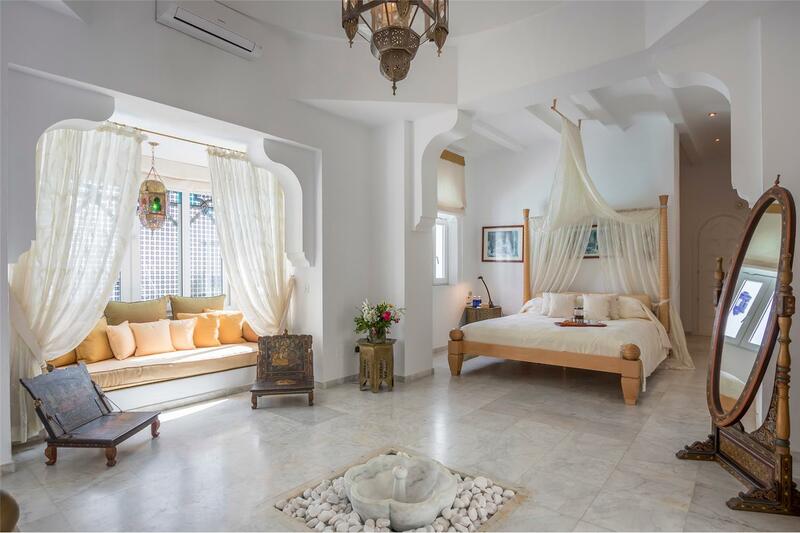 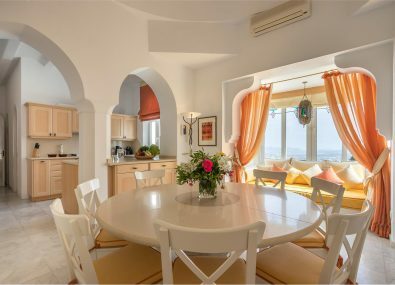 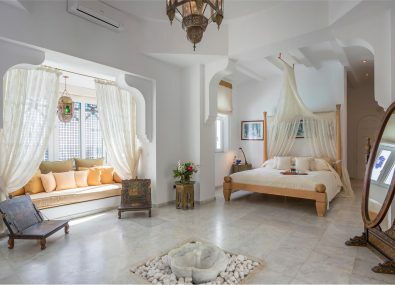 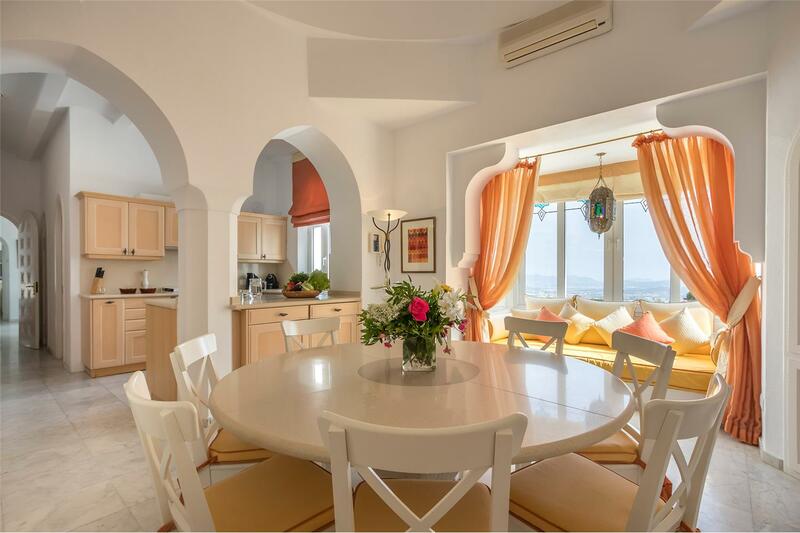 This property is an unbelievably accurate journey into North Africa, perfect for a group who want to enjoy this beautiful, natural island in a cultured environment.